Few films ever achieve the level of complete and total immersion as Raúl Ruiz's staggering and wholly remarkable Mysteries of Lisbon. It's over four hours long, spans decades and continents, and layers stories within stories, and yet never once feels overlong or ponderous. It feels gloriously lived in, like a great novel unfolding on screen, stately and astonishingly assured in its craft. It's the Gone with the Wind of the 21st century. And while it is perhaps more reminiscent of Luchino Visconti's 1963 Italian masterpiece, The Leopard, than the 1939 David O. Selznick Americana spectacle, Mysteries of Lisbon is fully and completely its own film. Ruiz, who tragically passed away earlier this year at the age of 70, has crafted something both sumptuous and intimate, a sprawling, labyrinthine epic that centers around young boy known only as João, living in an orphanage with no knowledge of who his parents were. Young Pedro Da Silva (João Luis Arrais) in MYSTERIES OF LISBON. When he discovers that his mother is, in fact, still alive, he becomes fascinated by his life story, and sets out to get to know her. His mother is a withdrawn, wounded woman, forever in love with a man she could never have. Forced to marry a man she did not love by her father, she saw João's father in secret, until he is shot one night after one of their secret rendezvous, leaving her forever scarred. João's journey of self discovery will lead him down multiple paths, as his mentor, Father Dinis, travels across the continent to disparate characters who flit in and out of each others lives, weaving the tapestry of the man João will one day become. Ruiz weaves each thread with such grace and precision that they never become overwhelming. There are flashbacks within flashbacks, tales within tales, and yet under Ruiz's confident direction it all fits together perfectly. It may be appear to be a grand costume drama (or soap opera, at times), but it also feels disarmingly immediate. Mysteries of Lisbon is, above all, impressions of an entire lifetime, unfolding like the memories of an old man recalling a life's worth of adventures. There's a Dickensian quality to its depth and breadth, and it never fails to hold the audience in its thrall. Ruiz is a born storyteller, and he grips us from the first frame to the last. 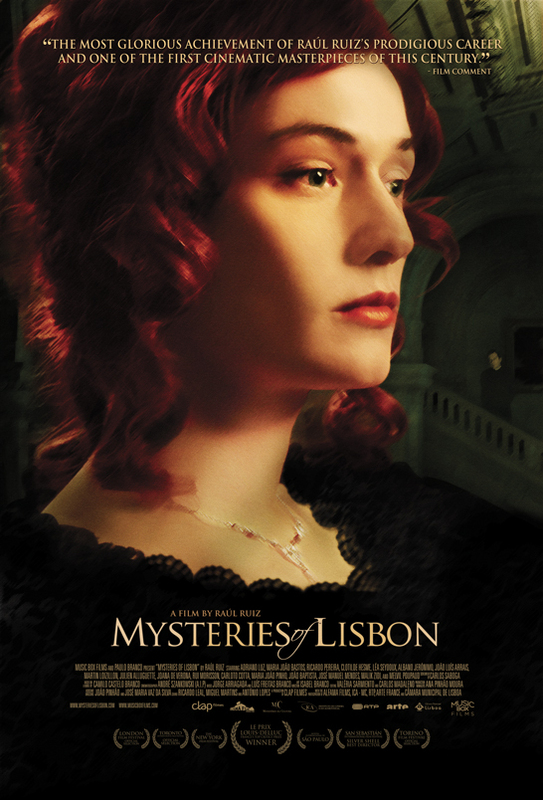 Blanche de Montfort (Léa Seydoux) and Benôit (Julien Alluguette) in MYSTERIES OF LISBON. It's certainly a lot of information to absorb in one sitting, and indeed the film benefits from multiple viewings, continuing to reward the viewer with new, deeper facets. Taking its literary structure from the Portuguese novel by Camilo Castelo Branco on which it is based, the film yields its rewards slowly and deliberately, and as such its all but impossible not to hang on every word. It's a world that's hard to leave, harder still to stay away from, because it sticks with you, beckoning us back to continue unraveling its deeply pleasurable mysteries. It has everything - romance, exotic locales, pirates, duels, battles, intrigue, revenge...what more can one ask for in a film? This is filmmaking on a rare and breathtaking scale. It's length is admittedly daunting, but you'll find that once it gets its hooks in you, you won't want it to end. Films like this don't come along very often, and that alone would make it something worth celebrating. But Mysteries of Lisbon is epic in more than just scope. This is an engrossing family drama, a heartbreaking romance, and an engaging mystery all wrapped into one. Through Ruiz's keen eye for storytelling and magnificent framing, the story of a generation seems to spring to life, distilled through one man's universal quest to discover who he truly is. The answer, of course, lies not just in a name, but in a journey of decades, of generations, factors beyond his control and even far removed from his experience. In Ruiz's capable hands, that journey becomes an unforgettable experience, a sweeping masterwork that stands as a fitting final testament to a towering career. MYSTERIES OF LISBON | Directed by Raúl Ruiz | Stars Adriano Luz, Maria João Bastos, Ricardo Pereira, Clotilde Hesme, Afonso Pimentel, João Luis Arrais, Albano Jerónimo | Not rated | In Portuguese & French w/English subtitles | Now playing in select cities.